Pure mucinous breast carcinomas (PMBC) are commonly lobulated, therefore appear relatively benign compared with the imaging features of invasive ductal carcinoma. The aim of this study was to determine mammographic and sonographic patterns of PMBC, in particular features that may result in misdiagnosis. 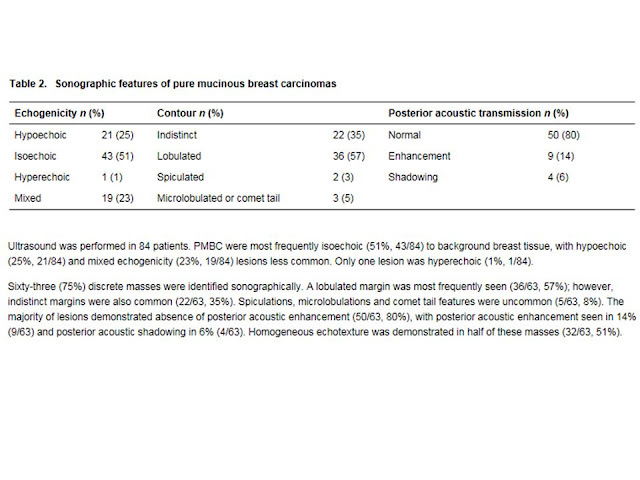 Retrospective review of available mammography and sonography in 90 patients diagnosed with PMBC within the Monash BreastScreen service, 1993–2011 inclusive. PMBC commonly have indistinct or lobulated mammographic and sonographic margins. Mammographic calcifications are absent in the majority (82%). On ultrasound, these neoplasms are commonly isoechoic (51%) with normal posterior acoustic appearances (80%). However, most (77%) of these lesions have suspicious or definite imaging features of malignancy. PMBC are commonly lobulated with homogeneous, isoechoic and normal posterior acoustic sonographic appearances but rarely have benign imaging features. Figure 4. Typical imaging appearances of pure mucinous breast carcinomas. Contact (a) mediolateral oblique (MLO) and (b) craniocaudal (CC) and spot (c) MLO and (d) CC mammographic views of the right breast demonstrating a lobulated mass with microlobulations (arrows). (e) Ultrasound demonstrates an isoechoic lobulated lesion with normal acoustic transmission. Figure 6. Imaging of pure mucinous breast carcinomas (PMBC) demonstrating interval growth. Contact mediolateral (MLO) mammography taken 2 years apart demonstrating a lobulated mass (arrows), which is difficult to appreciate on (a) initial examination but is more conspicuous on (b) later imaging. Further imaging work-up demonstrates typical appearance of PMBC on spot MLO (c) mammography and (d) sonography. Published literature regarding the imaging features of mucinous breast carcinomas are limited as it is a relatively uncommon malignancy. This Australian study is the largest contiguous series of screen-detected PMBC in an asymptomatic population to date. There have been varying reports in previous publications regarding the presence of calcifications, ranging from rare[1, 4, 9, 15] up to 62.5%, and are seen in the ductal rather than mucinous component of the tumour. We found mammographic suspicious or indeterminate calcifications in only 18% of tumours, with associated DCIS found on pathology in one-third of these patients, a similar rate to Cardenosa et al. Although 25% of tumours in this study could be identified retrospectively on an earlier mammogram, which is lower than the 38% described by Dhillon et al., delay in diagnosis did not affect prognosis, with no significant differences in tumour size (12.5 mm compared with 15 mm) or axillary nodal metastasis (5% compared with 9%). Furthermore, the imaging appearances in this subset of lesions were similar to the majority of PMBC diagnosed as a new lesion. In this large series of asymptomatic women with an average tumour size of 15 mm, 75% of lesions were identified as a discrete mass on ultrasound. Non-palpable PMBC are less likely to be seen sonographically, with only 39% identified in a recent screening study. Although a solid mass is seen on ultrasound in majority of lesions (92%), it has been suggested that cystic components in a mass in an older patient should raise the suspicion of mucinous carcinoma. Spiculations and posterior acoustic shadowing, typical for IDC, are rarely demonstrated. Enhanced sound transmission has been described in 71% mucinous carcinomas, and in particular in 100% of those >1.5 cm. This is an uncommon finding in our study, attributed to advances in sonographic equipment enabling compounding, which diminishes acoustic transmission characteristics by steering the beam in at multiple different angles. Identification of mucinous carcinomas on ultrasound may be difficult as these lesions are frequently homogeneous, isoechoic to normal breast tissue with normal posterior acoustic appearances and indistinct contours.